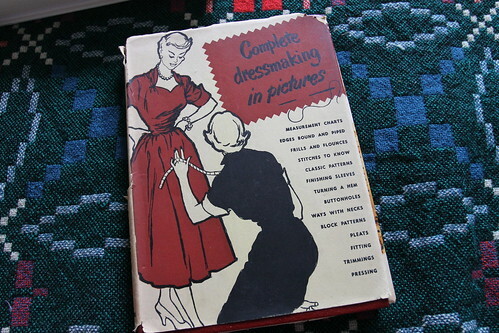 I love a good sewing book, I have shelves heaving with various books ranging from dry old text books through to gorgeous modern sewing books with lovely glossy photos. I have far too many on my wish list at Amazon. My very favourite books though are old, you could call them vintage if you wanted to be fashionable, but really they are just old. Oh how I love this book. Every sewer should have one. This book has everything, every technique you will ever need in detail with lovely clear diagrams. 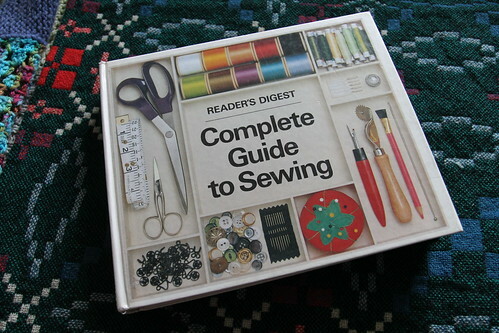 I urge anyone wanting to take up sewing to buy this book. Older copies come up on Ebay frequently and are inexpensive, but you can get up to date copies too. Really, just buy it. 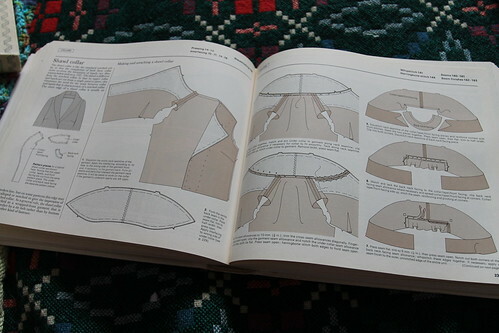 I still refer to this book despite having been sewing most of my life. I picked up this book at a Brownie jumble sale for 50p about 10 years ago. I think it dates from the 1940's, but I can't find a publishing date. Firstly I have to say I love this book because it smells old, and it's well worn, you can tell someone has used it again and again. Despite being called "Complete Dressmaking", I think most modern sewers would find a great deal missing. An awful lot of prior knowledge is assumed, and the patterns in the back require a certain amount of pattern drafting know how. I do love to flick through it though, and keep meaning to make up some of the patterns, it's on my to do list! 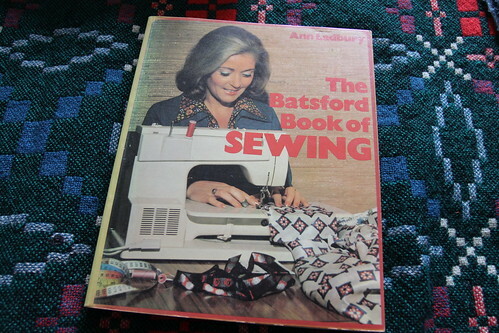 The Batsford Book of Sewing. 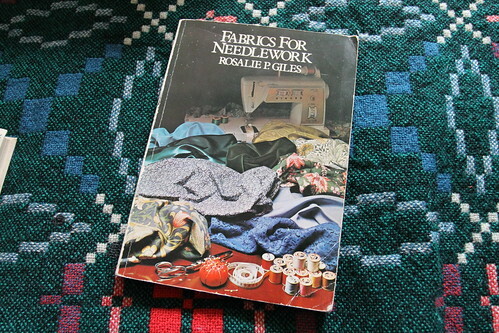 This is one of the books I had for A level needlework at school. I believe Ann Ladbury was briefly a teacher at my school (before my time), and I think she had a tv series sometime in the early 70's. 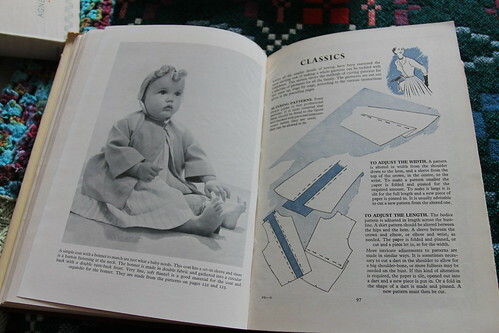 This book is alphabetical starting with Alterations and finishing with zips. 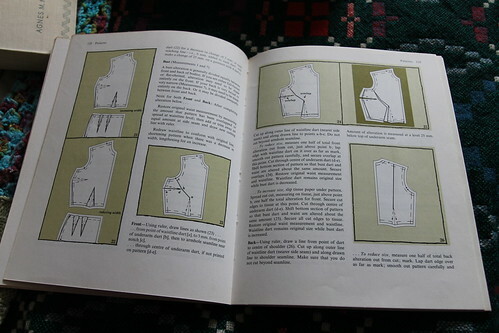 Lots of lovely clear diagrams, a handy book for a quick look up of something. Flipping through this book makes me smile as it reminds me of A Level homework. we'd often be given homework along the lines of "Design a dress you might wear to an afternoon tea party, describe the fabrics you might use giving reasons for your choices, draw the pattern pieces, and layout then describe your order of work." I loved this kind of homework. Another book from back when I was doing A Level at school. 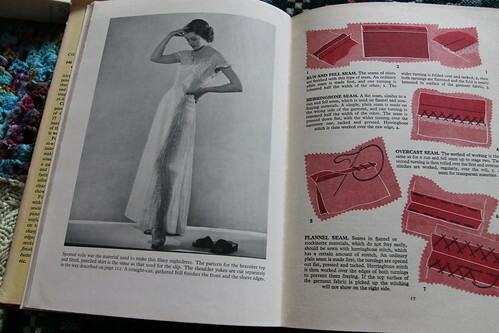 This book is really very dated in that many modern fabrics are of course not included, but all the basics are there, and described right from properties of the fibre, through construction of the fabric . I actually do use this book a lot, mostly for burn tests, I like doing burn tests, and they are jolly useful when buying fabric from various places where they are not always clearly labelled. Now this really is a little gem. I can sit and read this book like a novel. This paticular copy is dated 1946, but you can see from the photos that it was clearly written at least a decade earlier. This book covers all needlecraft, embroidery, dressmaking, knitting and crochet, patchwork, home upholstery etc. 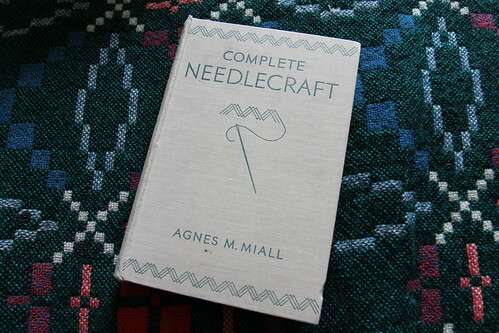 There are very few photos, and this book assumes a great deal of prior needleworking knowledge. 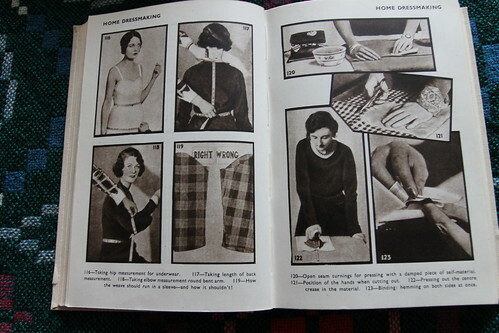 In the introduction to the "Home Dressmaking " chapter, the author talks about dressmaking becoming so much easier after 1914. 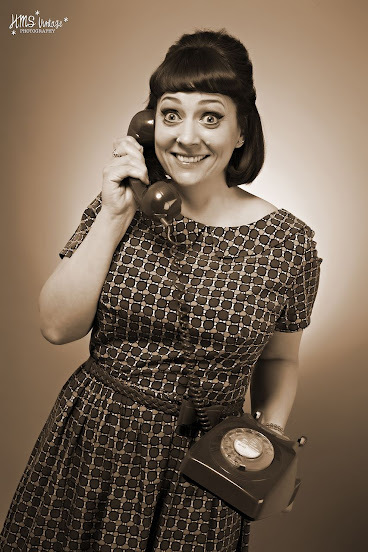 "So, you see, home dressmaking is no longer a skilled art for exceptionally clever needlewomen,but a pleasant job that even the most inexperienced can take up with success. In these days it is no exaggeration to say that if you can sew (and who can't?) you can dressmake also." I love that a flat iron and iron stand is listed in the essential equipment, an electric iron is listed in optional equipment.The author also mentions folding ironing tables as an optional extra, I'm guessing ironing boards were a fairly new invention when she was writing? "Most women,even if they have never done any dressmaking so far, know the ordinary plain sewing stitches. They are learnt at school and used so constantly for ordinary sewing jobs that they are never forgotten. For this reason such everyday stitches as hemming,overcasting, and whipping are not included in this book..."
I really do love this book. When I read it I feel connected to so many before me who were taught to sew and enjoyed their craft. Simply it makes me very happy! 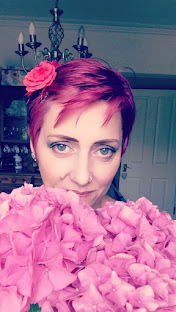 I'd love to know what your favourite books are, leave me a comment and let me know. I had Ann Ladbury books at school too , they are excellent. I think I have the readers digest book up in the loft where my machine sadly sits neglected, since I rarely have time to be up there in the peace and quiet ... I'm working on that one! Thanks for sharing and I love looking at all the old designs. Thank you for this post, I've just bought a few of these online. I have been rather overwhelmed by the range of books on sale, but wanted something reliable to refer to. 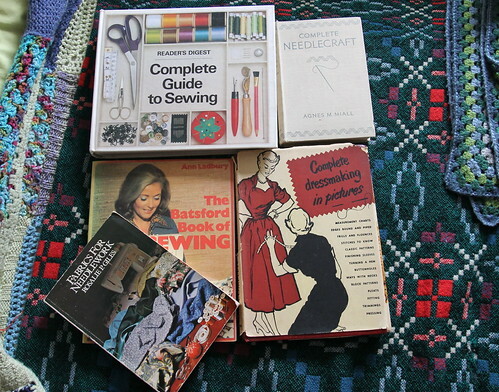 I have been going to a weekly sewing class with a wonderful teacher, but won't be able to go back until September, and that depends on the kids and finances, so its really nice to have reviews of useful books. One of my biggest regrets is sewing wasn't taught in my schools- I might have found out how much I love sewing and crochet 20 years earlier! I need to bookmark this to come back to it when I finally buy my sewing machine. It was my goal for my 40th to learn to machine sew but then I decided to sort out my driving first, now the sewing machine has become the treat I will buy when I feel it's the right time because I've been doing well with my driving (so, soon really!). Another quick cheery spring make.